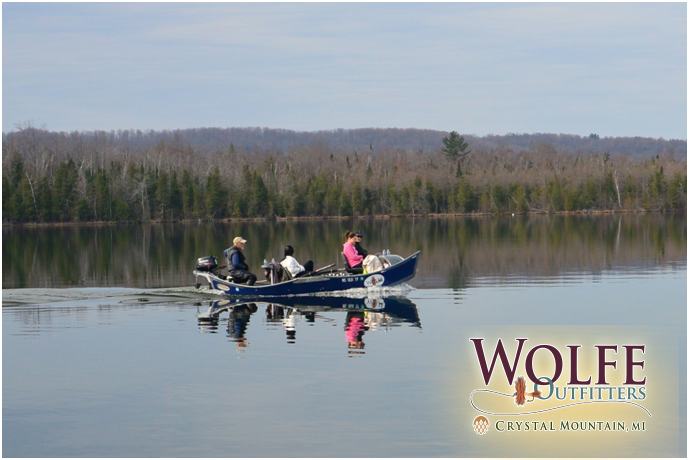 Lisa, Michelle, and Willow off for their fishing adventure with Wolfe Outfitters guide Bear Andrews. Crystal Mountain recently had a weekend dedicated to its property owners—those families that own condos or rooms at this 4-season resort. Wolfe Outfitters, a joint venture with Crystal Mountain had our formal introduction to the property owners, and we hosted the Fiesta Night cocktail party. We were fortunate to have a great turnout for the event, with over 200 people having signed up to attend. Wolfe Outfitters had a couple of tables that we set up with various fly boxes, fly tying materials, fly reels, rods, nets, rack cards, banners and, of course, lots of Wolfe Outfitters swag to give away! Decals, Simms thirsty trout bottle opener key-chains with our logo, beer koozies, and some shirts and hats. We worked with Simms Fishing Products to get our logo onto a few sweet looking shirts and hats as well. The dye-sublimated Ebb-tide shirts, DeYoung artist series shirts, and Solarflex shirts all came out looking awesome. They look really sharp, and should look great on and off the water. We generated quite a bit of interest from various property owners, getting to know many of them, as we chatted about the resort as well as about fishing! We had 4 of our guides there, plus a few of the resort staff to help answer questions, lend a hand, and even book trips for people. Our head fly guide, Jeff “Bear” Andrews, did a special fly tying demo, tying up numerous flies in an effortless way that drew quite a crowd of onlookers. Or, it could have been the kilt that he was wearing in honor of the event and the Crystal Mountain owner’s heritage! Either way—kilt or fly tying demonstration—there was quite a crowd. The last highlight of the evening was a raffle for more free swag and a trip giveaway. Cheers went up as the winners of shirts, hats, fly boxes were announced, but there was a definite tension in the air as everybody awaited the announcement of the lucky guided trip winner. Wouldn’t you know, the winners of the trip were not the many avid anglers in the crowd, but 3 giddy women, who were on a girls getaway weekend together! They were looking for something new to experience together, and were contemplating booking a trip, but decided to enter the raffle first to see if they’d win. Of the huge net-full of raffle entries, who’d have thought!